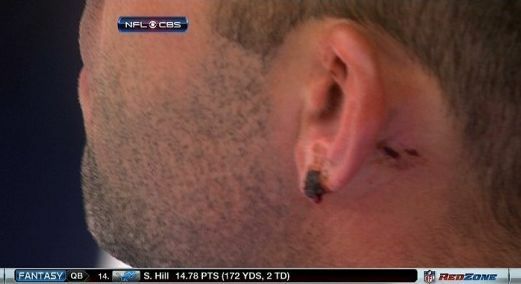 Quite a hit there on Matt Schaub. I’d have died on the spot. Before I get into to Schaub… couple things to note about this .gif. Check out the bird on the field flying away right after the hit. Second, who hits like this? Watch Joe Mays’ arms… they’re wide open, never even coming together to wrap up Matt. Is that what they’re teaching now? That’s bush. And it looks stupid. “I feel fine,” Houston quarterback Matt Schaub said after the 31-25 win in Denver. “I just lost a piece of my ear.” He said matter-of-factly. The brutal helmet-to-helmet hit by Denver linebacker Joe Mays knocked Schaub’s helmet, and Schaub, into next week for a couple of minutes. And it will surely result in a big fine for Mays. Lemme ask you this… what does that mean, “lost a piece of my ear”? Not trying to downplay this but I’ve lost a piece of arm or back or knee just about every time I get scratched playing pick up hoops… skin gets scratched off, piece gone. Sounds stupid, huh? So, “piece” has to equal more than skin, right? I see the scab on his ear, but what’s gone? I mean, with Van Gogh, he cut the damn thing off and threw it in an envelope. Holyfield? Had to pick it up off the mat. Where’s Schaub’s missing piece? I don’t really care… just food for thought on how anything can be dramatically phrased. Take you, for example, right now… pretty easy to argue that you just lost a piece of your soul reading this blog. That’s how bad it sucked. This entry was posted in Football, NFL and tagged matt schaub, matt schaub ear. Bookmark the permalink.